Suicide rates are rising across the country. Can the voice on the other end of this line help? About 50 crisis counselors work in New York City�s 24/7 suicide-prevention center. Calls to the national lifeline increase 15% a year. The bridge phone inside New York City's suicide-prevention call center rings only about once a month. But when it does, often in the middle of the night, it emits distinct, deep chirps  as if the phone itself is in distress. 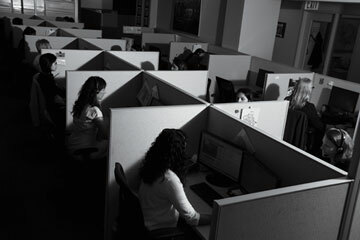 The operators manning the 24/7 LifeNet hotline recognize the sound immediately. It means someone's calling from one of the 11 area bridges, and they're likely thinking about jumping. LifeNet, a mental-health and suicide-prevention hotline servicing the New York City metropolitan area, is one of 161 call centers that make up the National Suicide Prevention Lifeline network, which is headquartered in the same building. During its busiest hours, from 9 a.m. to 7 p.m., the hotline has roughly 20 operators working the phones inside an unassuming L-shaped office space in lower Manhattan. Suicide rates have been climbing in the U.S. since 2005; that has led to a debate over how best to prevent it. Over the past 15 years, public policy and federal funding have shifted toward a broader mental-wellness movement aimed at helping people deal with anxiety and depression that could eventually lead to suicidal ideation. But critics of the shift worry that it may have left those most at risk of suicide, such as those calling on the bridge phone, without the support they need.